Hero Arts | My Monthly Hero June Blog Hop. Travel Tag. Giveaway! Hello all and thank you for stopping by today to help celebrate the launch of June My Monthly Hero Kit from Hero Arts (more on that below). Because my hubby and I enjoy traveling, this kit is probably my favorite one to date. I love the tag die, the journal, the stamp sets – everything! Its perfect for an avid traveler and I can already picture myself using it during our next vacation. We are not traveling anywhere at the moment, but because I wanted to showcase the kit anyway I’ve created a travel tag. I can see myself using it as a bookmark in a book I’ll take on vacation or even as an embellishment on the journal cover. Want to see additional inspiration with this kit? Visit Hero Arts Blog! It took me about 4 attempts to make this one as the order in which certain things are done (like ink blending, die cutting etc) is important when making it. First I die cut the tag shape out of white cardstock, I only needed one tag, so I only die cut one (made a partial cut). Next I blended 3 colors of ink to create a sunset-type background – Dandelion, Butter Bar and Strawberry. I love this color combo, its great for creating warm backgrounds on small surfaces, if I am working on a card front I would typically add one or two more colors to this combo. 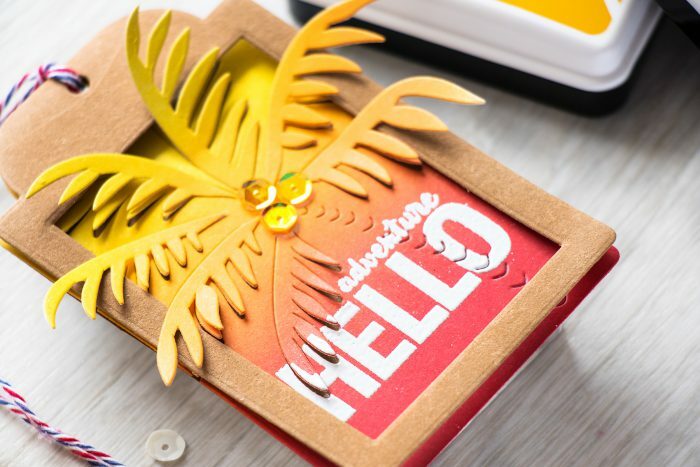 Next I die cut the Paper Layering Palm Tree die (I am loving it this Summer, check out additional inspiration using it HERE and HERE), dried my tag with a heat tool to make sure the ink was completely dry and double heat embossed Hello Adventure sentiment from the kit with the help of my mini MISTI tool. If you first emboss and than die cut, embossing powder tends to come off in the die cut sections and obviously the end result doesn’t look as nice. So its best to first die cut and than heat emboss. I die cut another tag out of leather paper (this is seriously some awesome stuff – I loved that paper) and adhered my ink blended and die cut tag inside. To complete the travel look and feel I added a bit of airmail twine. I wanted the palm tree branches to expand beyond the tag, so I ink blended one more background and die cut the palm tree die one more time. Using my scissors I trimmed the branches and adhered them in the center of the palm tree so they would overlap the leather die cut tag. To cover up the ends of the branches I added 3 yellow sequins in the center, they also mimic coconuts here. The kit is available for a limited time only – once it’s gone, it’s gone so if love it- better grab it now! 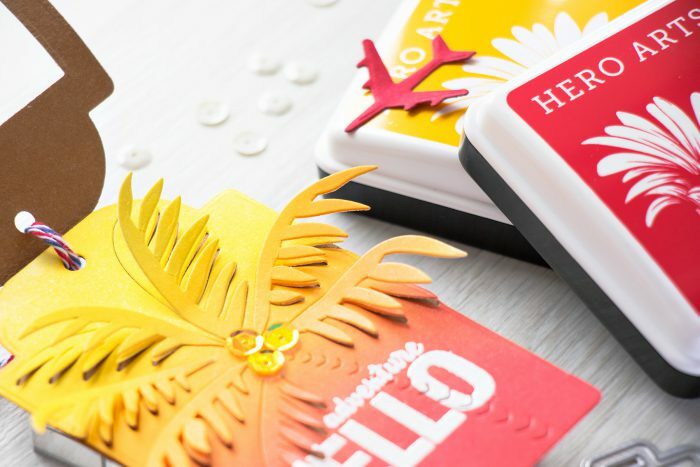 The kit contains: A luggage tag die (die size 8 1/4″ x 2 5/8″, finished tag 4 1/8″ x 2 5/8″), seven accessory dies (heart, camera, sunglasses, sunshine, geotag, suitcase, airplane), 4×6 clear stamp set, two half sheets of Sizzix tan Paper Leather, three geotag clips, airmail stripe washi tape, journal, three map hearts, airmail twine, clear tag holders. Kathy Racoosin – next stop! How clever and creative you are. Well done. Hi Yana ~ Your colorful blending is always exquisite, no matter what color pallet you choose. This tag is bright and cheery and the addition of sequins is fun. Nicely done….thanks for sharing. So cute, Love the Colors. Thanks for sharing. Wow! I love the colors and the dimension created with the palm leaves. This is such a great tag. Love how part of it pops off of it. You tags are pretty – i love the bright colours…..
What a versatile kit! I love your tags & cards! Clever and stunning!! Oh my goodness Yana, this is a gorgeous tag! The more I see of this kit the more I want it! Such fabulous stamps & dies but also love the journal and def. want to try out the paper leather! EEEK! A fab. kit!!! Thanks for the chance to win it! Gorgeous tag card…love the dimension. Nice colorful tag with good instructions. This is a perfect idea for the upcoming travel season. How utterly gorgeous! Your tag is phenomenal! Everyone’s project is convincing me to get one of the kits! 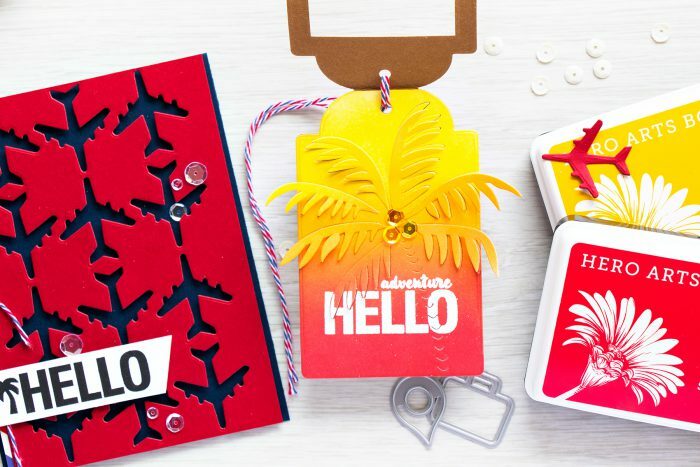 So incredibly creative and definitely gets me in the mood for travel! Funky tags. Thanks for sharing. WOW I really love this kit!!! Wow! Love the way you used the dies to create dimension! Love the Tag/bookmark whatever you want to use it for. Great idea, good color combo and the kit is great. Thanks for sharing. What a fun tag, endless possabilities with this kit!! Love the pineapple die! I really need to get that! Great new kit. So cute what you did with this! I LOVE the palm tree tag!!! Great color combo and dimension. Great idea…I love the colors on the tag blended to look like a sunrise. Love the ink blended sunset background! Wow!!! I love this new kit and your amazing tag card!!! Love them colors used, so perfect with three palm tree die. I love how the tree is sticking out of the tag, Yana! Super fun. Great kit. Thanks! Awesome project! Love the tag – would look great on a suitcase! My favorite part of this project would have to be the color blending – so beautiful! So eye-catching. Love the palm tree. Your tag is fab but I love your airplane card! Oh wow!!! Love the bright colors and creative layouts of your projects. Just love those little red die cut airplanes. This set is great with so many possibilities! Love the way the palm tree is just hopping out to take you an a trip. Wow, did you get creative! I love what you did and the fact that you used my favorite color, which is yellow, is even more of a plus! So far you are the only one I’ve seen so far that used dimension in your tag. Love it! Nice job! Love the colours on your tag. Makes me want to set off on my travels right now! Love those colors, so summery! And love the technique you did to add the layering of the palm tree! 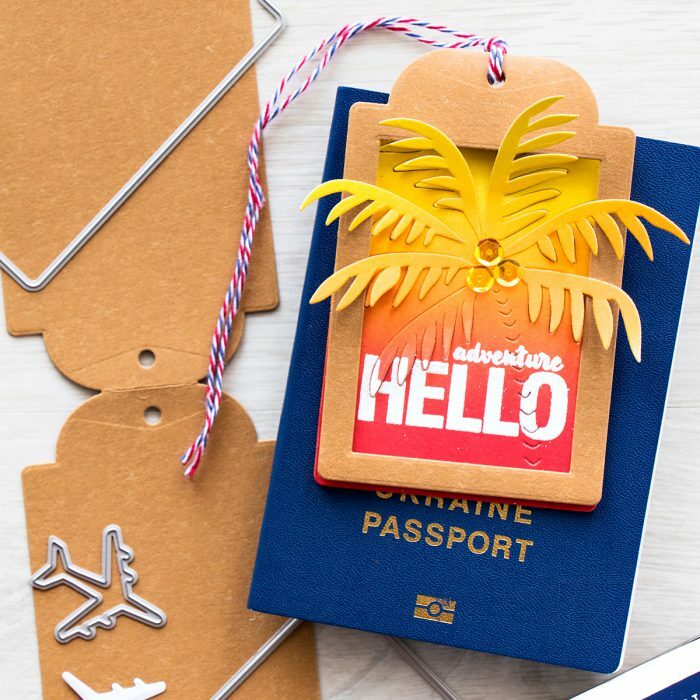 Just love that tag – the colors and the palm tree are wonderful! Unfortunately, the kit is already sold out – I’m bummed – but maybe I’ll win it! What fun vibrant colors! 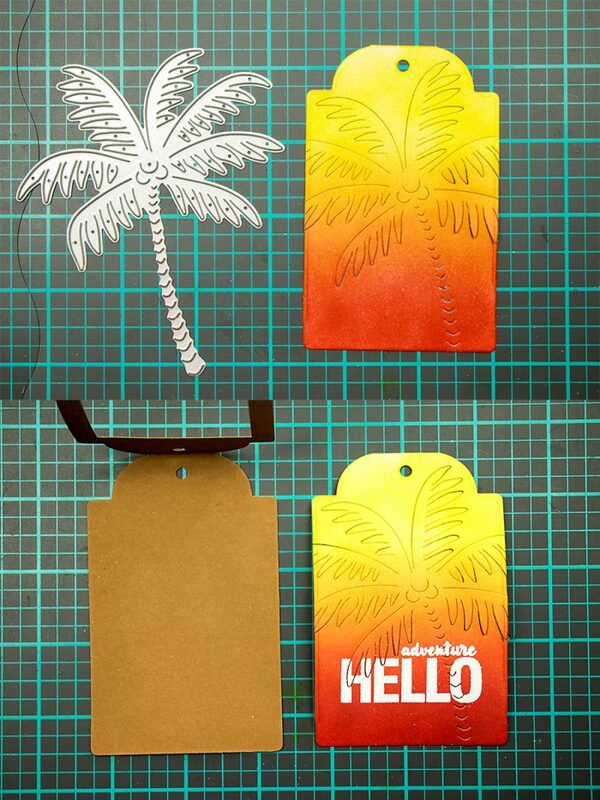 That palm tree looks great with the luggage tag and that leather paper. The red and black is nice too! cute tags and like the brightness.